Joe Bertagna will be present at each school. A graduate of Harvard University, Joe is considered one of the premiere goalie coaches in the United States today. In the summer of 2016, he was inducted into the Massachusetts Hockey Hall of Fame. In 2017 he received USA Hockey's Distinguished Service Award. A year later, he was inducted into the ECAC Hall of Fame. A former Harvard goaltender, Joe's resume includes six seasons as goalie coach of the Boston Bruins and he also served in that capacity with the 1994 U.S. Olympic Team. While with Boston, he enjoyed two trips to the Stanley Cup Finals (1988 and 1990). In addition to Joe, more than 15 other coaches will work during the summer of 2018, many drawn from active college and professional goaltenders. 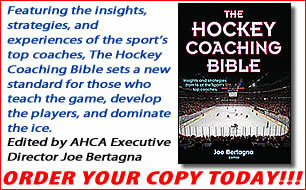 Joe works fulltime in college hockey as commissioner of the Hockey East Association and as Executive Director of the American Hockey Coaches Association. Joe's ability to attract college and professional goalies to the staff insures that the most current techniques will be part of the curriculum. For all that Joe has accomplished in college hockey, Joe first made his name as a goalie coach. Joe Bertagna believes in emphasizing the mental aspects of playing goal, while covering all fundamentals on the ice as well. While techniques have changed over the years, the importance of positioning and rebound control remain the building blocks of the position. Goalies will receive age-appropriate instruction from New England's best staff. Joe Bertagna and his staff are available to work with youth hockey programs during the winter. During the winter of 2018-19, Joe helped teams from the following programs: Beverly Youth Hockey, Billerica Youth Hockey, Cape Ann Youth Hockey, The Governor's Academy, Marblehead YHA and the Central Mass Outlaws. Joe also serves as goalie Governor's Academy girls and boys. Joe will tailor a program for your needs. On-ice clinics. Game observations. Tryout evaluations. If you are interested in any of these services, contact Joe at jbertagna@hockeyeastonline.com. Now well into its second decade, the Adult Women's Spring Skills Clinic has been a huge hit, sold out annually and featuring a high percentage of returning attendees each year. Joe, who was the first head coach of Harvard University's women's team, directs this clinic on 8 spring Monday nights at The Edge in Bedford. His co-directors are 1972 Olympian Stu Irving and longtime Arlington H.S. coach Bob Bartholomew. Approximately 25 skaters and 2-4 goalies sign up each year for ten 80-minute sessions. It is a lot of fun and a good learning environment. Joe's college hockey contacts make it possible for some of New England's top female coaches to join the regular staff on a weekly basis! Due to an increase in families requesting late changes, there are NO refunds after July 1. Any family sending more than one member or anyone signing up for two weeks will receive a $25 discount on the second application....This is NOT a boarding camp. Joe will provide lists of motels and hotels close to each rink upon request (as well as directions to each rink.) Call Joe at his Hockey East Office via 781-245-2122 (days) or on his cell (978-376-5494).